Škoda’s transformation over the past two decades under the auspices of Volkswagen is the stuff of many an engaging business case study. So much so that it’s easy to be somewhat blasé about its achievements. But despite the relative recentness of Škoda’s improvement, customers have become accustomed to a long line of fine cars from the Czech brand, each offering an attractive blend of good looks, capacious cabins and fine value. So does the Yeti continue the rejuvenation of the marque? 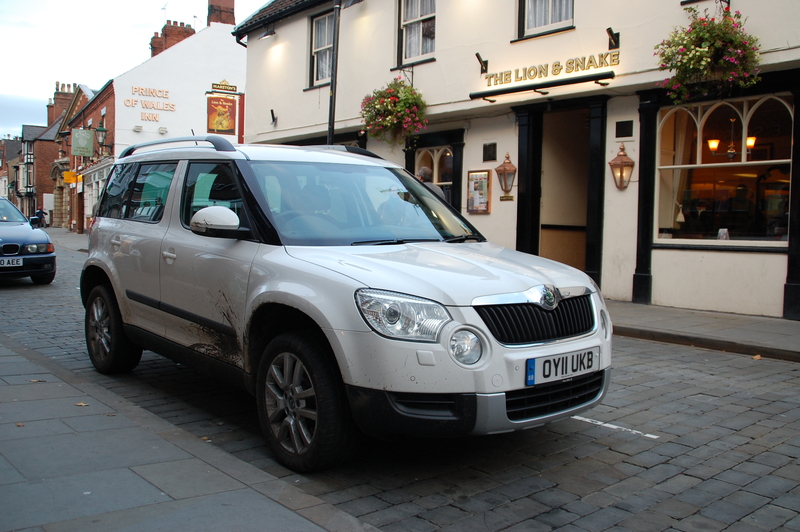 The Yeti is Škoda’s first entry into the sport utility vehicle (SUV) market, but not only does it represent new sales territory, it demonstrates a shift of emphasis in terms of how the brand is perceived. It comes as no surprise that it’s built on one of the Volkswagen Group’s adaptable platforms, in this case, the same basic architecture that underpins the Golf and its derivatives (geeks rejoice at the PQ35 chassis code). 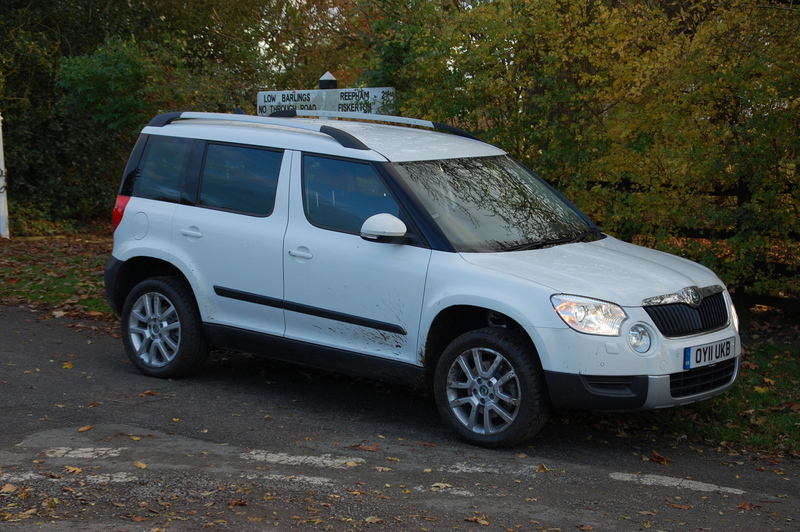 But unlike other Škodas which offer a larger body than their group siblings, the Yeti is rather petite. 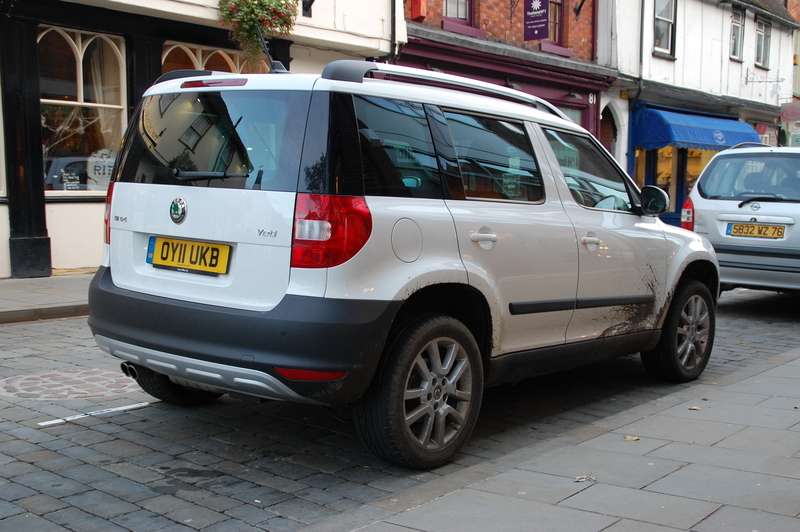 At a dinky 4.22m the Yeti is some 20cm shorter than the similar-chassised Volkswagen Tiguan. This is a bold move by Škoda but one it seems resolutely committed to. By offering a range of cars that aren’t significantly bigger than others in each class, it’s sending out a message that consumers now recognise it as part of the establishment – people are buying Škodas because they’re Škodas, not because of marketing strategies maximising the additional metalwork for your Pound. After exploring the Yeti for the week, I believe that Škoda is right to pursue this strategy because it is a remarkable car. Labelling it an SUV pigeonholes it unfairly because the Yeti has the potential to benefit many people, easily fitting into their lives. Its compact dimensions and high seating position mean it’s a doddle around town, being easy to park and see out of. 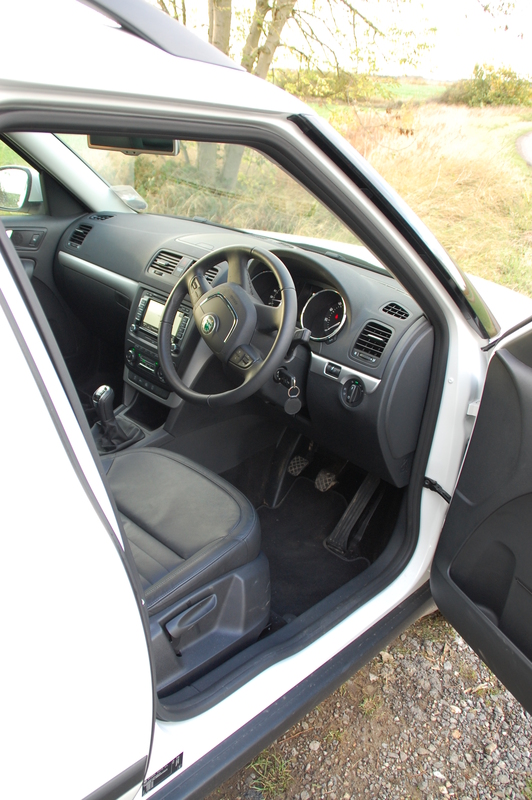 Yet, despite its size, the interior is spacious, with room for five and a decent boot. Each of the three rear chairs tips and folds independently, which when combined with the roof rails, means the Yeti offers great van-like practicality. After the good-looking conservatism of the recent mainstream models, the Yeti illustrates that Škoda’s stylists aren’t afraid transferring imaginative drawing board creations into production realities. Okay, it’s not the out and out bonkers riot that the Roomster is, but the Yeti is a car with character. There’s an endearing, child-like simplicity to its vertical lines and prominent two-box shape with an obviously protruding bonnet line. How many other cars these days can you see the majority of the engine cover from the driver’s seat? Woven into that boxy styling are a couple of areas of particular interest. Firstly the rising curve of the window line on the front doors creates a visual separation between the front and rear halves of the Yeti. It’s a distinctive but less extreme version of that on the smaller Roomster. 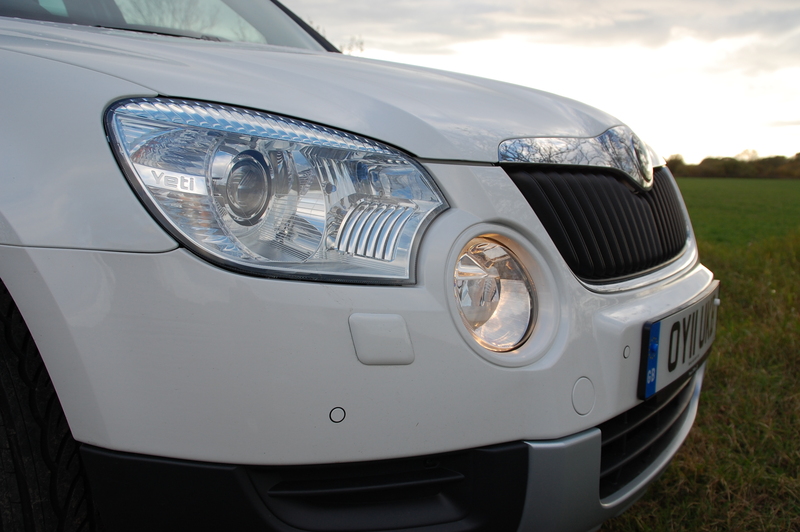 The nose is dominated by two circular light units that bisect aggressively into the main headlights. Behind the Perspex, the trailing edges of those circular lights appear to have gills, linking the two – style rather than function and glorious for it. And there, on the edge of the headlights as they meet the front wings, Škoda’s signature model name inscription in the silver moulding. In typical no nonsense fashion, the Yeti isn’t a sop to the blingtastic frippery that adorns many of its key rivals, the solitary chromeware being the grille surround. Elsewhere it’s body coloured simplicity or unpainted grey plastic ruggedness that are the order of the day. Those squat, square looks make the Yeti look tough and ready for whatever can be thrown at it. Spot the tiny Yeti badge? 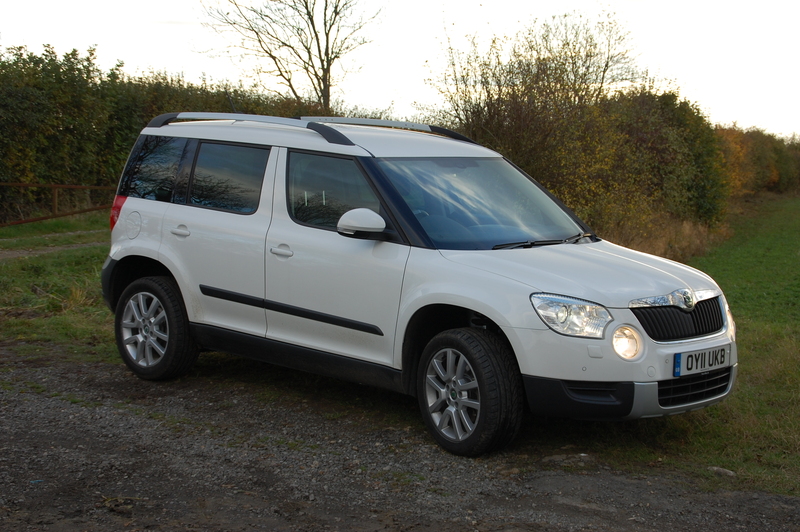 Škoda offers a comprehensive family of Yetis to suit a variety of pockets and needs. E, S, SE, SE Plus and Elegance are the trim levels in ever increasing levels of standard specification and niceties. Depending on the chosen spec, there’s a range of petrol and diesel powerplants: unleaded fans have a selection of 1.2-, 1.4- and 1.8-litre TSI units, with DERV lovers choosing between 1.6- and 2.0-litre common rail versions of the venerable TDI units in various levels of power outputs. Depending on the model mix selected, Yetis come with either front- or four-wheel drive and manual or DSG (automated manual) gearboxes. Prices range from the E 1.2 TSI at £14,830 up to the Elegance 2.0 TDI CR 140PS 4×4 with DSG transmission at £24,090. Space for a brace of Sherpas inside? Wrap your fingers around the Yeti’s chunky pull door handle to enter the cabin and immediately you experience its solidity. Not only does it look tough, it’s built to last too. The interior on this Elegance level model was dark grey and black, in stark contrast to the washing machine white exterior paintwork, ensuring it looked a little dour inside. 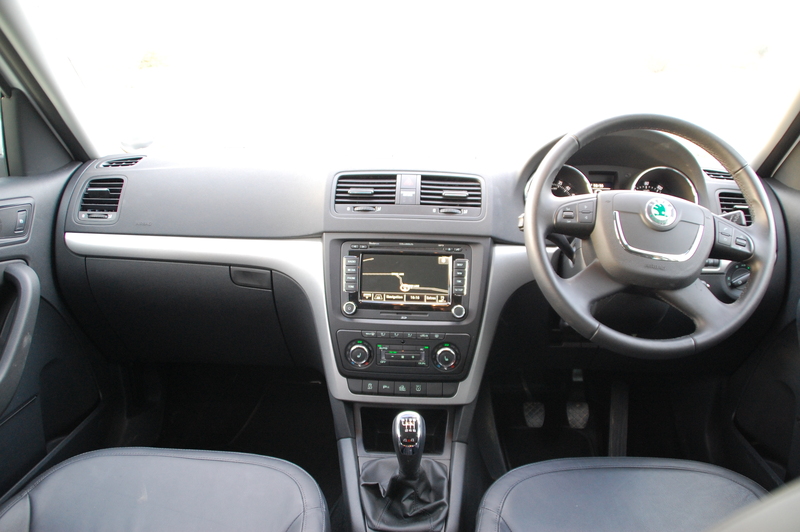 The dashboard itself is surprisingly conservative given the distinctive set square looks of the exterior, and shares many cues with that of the Fabia and Roomster. Again, build quality feels impressive, with close fittings of all the mouldings, many of which are of soft touch variety. Slender fillets of brightwork help lift the cabin and little, while the central colour screen provides light and further visual interest. All the buttons and switches are backlit in a vibrant hue of green which matches the shade on the Škoda badge, breaking the general fascination of orangey-red employed by many brands. Getting comfortable is an easy task with six-way adjustment of the seats as well as the steering wheel, which moves on two planes. Although the wheel and gear lever fall easily to hand, the switchgear, whilst pleasant to use, feels low down on the central console. You have to familiarise yourself with the car a few times before knowing which button or knob does what becomes intuitive. The Yeti’s front seats are great too, proving extremely comfortable on long journeys and despite looking relatively flat, offering fine support for more vigorous driving. The soft, black leather was a welcome addition too, and naturally they were heated, which was most gratifying on the chilled morning runs it undertook. 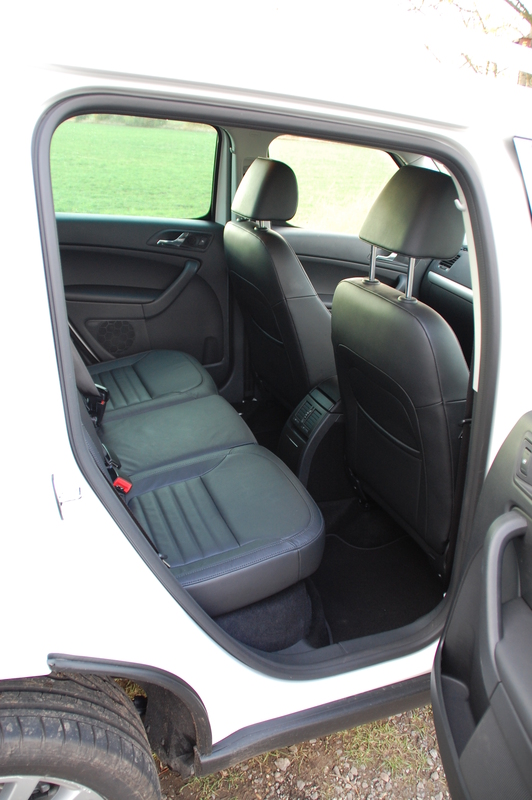 The rear bench is in fact an MPV-like arrangement of three individual seats, with the central one being somewhat slimmer than the outer two. All tumble and tip independently and without a hint of palaver. Such flexibility will be attractive to buyers with families who also double up their car to carry bulky and long loads. Rear seat space is fine too, considering the Yeti’s small footprint. Knee room for my 6ft frame was very generous, although while three adults could use the back seat at a squeeze, it would be perfectly spacious for two. 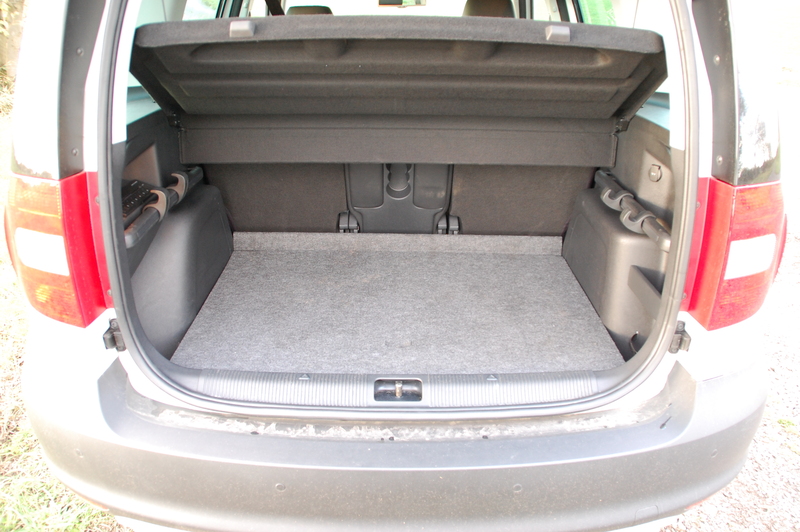 Open that vertical tailgate and you’re greeted with a useful 416l of sensibly shaped space, which extends to a very generous 1760l with the cargo bay maximised. Thoughtful touches abound in the trunk too, such as hooks on a sliding rail for carrying shopping bags and thus preventing a delicate cheesecake losing a battle with bottles of wine in the post-supermarket run boot-based demolition derby. Closing that tailgate is a manual function, but rather than a niched out slot for fingers to grip, you’re presented with a rubbery handle, not unlike those found on toilet chains of yesteryear. Evidence of the Yeti being flushed with success, perhaps? Elegance specification Yetis are comprehensively equipped, as a top of the line model should be. In exchange for parting with a larger amount of cash, you get dual-zone climate control, full leather heated seats, trip computer, automatic lights and wipers, electric windows and mirrors and rear privacy glass. The colour screen satnav package fitted was an extra £1510 – expensive for such a system, so consider carefully how much you might recoup come re-sale. Go anywhere fun or an abominable slow man? The Yeti’s driving characteristics are bound to take you by surprise. 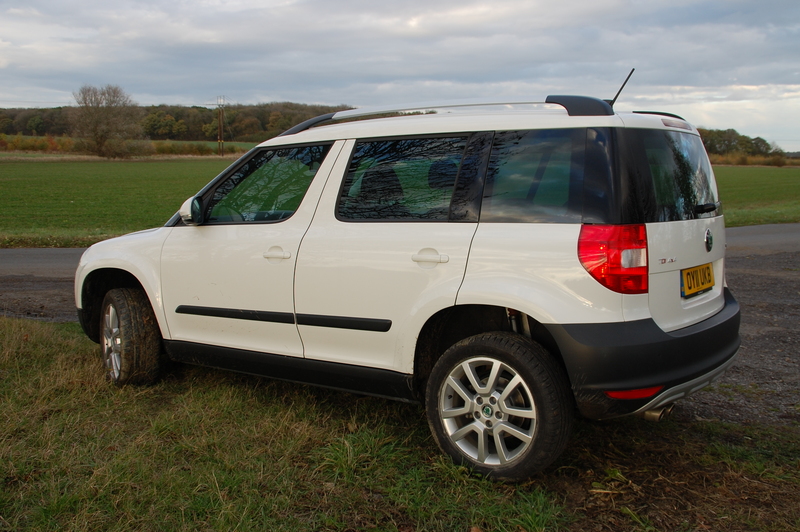 You don’t tend to look upon small SUVs as being particularly engaging road-mates, due to their height and raised ground clearance, but to do so with this Škoda is a mistake. Let’s not get carried away, it’s no sports car, nor does it pretend to be, but it’s a car in which you can have a decent amount of fun in at any speed and on any type of road. It’s as fine a motorway cruiser as it is easy to drive and smooth riding in urban sprawls. Take a detour onto a winding back road and the Yeti plays ball too, handling with great tenacity, no doubt aided in this case with the additional grip offered by the 4×4 system. 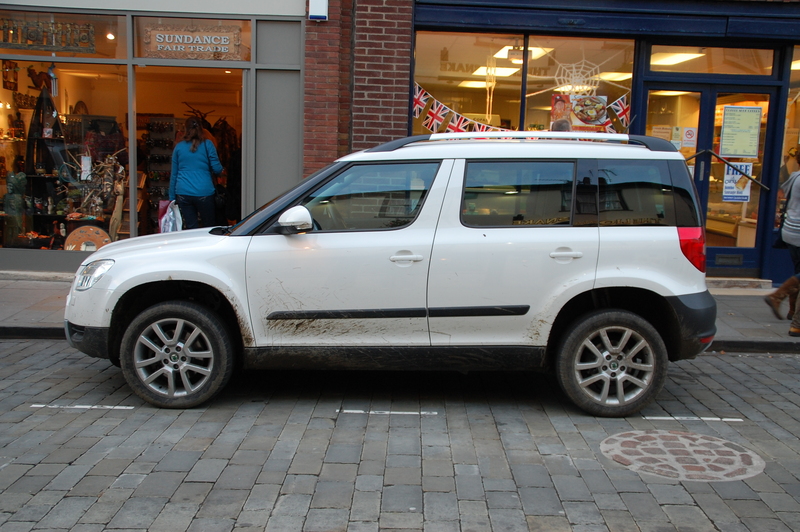 Unfortunately, Lincolnshire’s about as hilly as a bakery full of pancakes, so serious off-roading was not on the agenda. Fortunately, a farmer had kindly left the gate open down one of their field-side tracks, which was unsurfaced, muddy and nicely rutted. The Yeti traversed it with ease and I’m minded that perhaps a ten a penny front-drive city car may have done too, but I doubt it would have been as quick, as surefooted or as comfortable should it have managed it. And the resultant mud splats made me look a bit more convincing – I had a short-lived urge to lower the window and exclaim to all and sundry “I’ve just off-roaded”. I didn’t, I hasten to add, but I could have done and been convincing too. 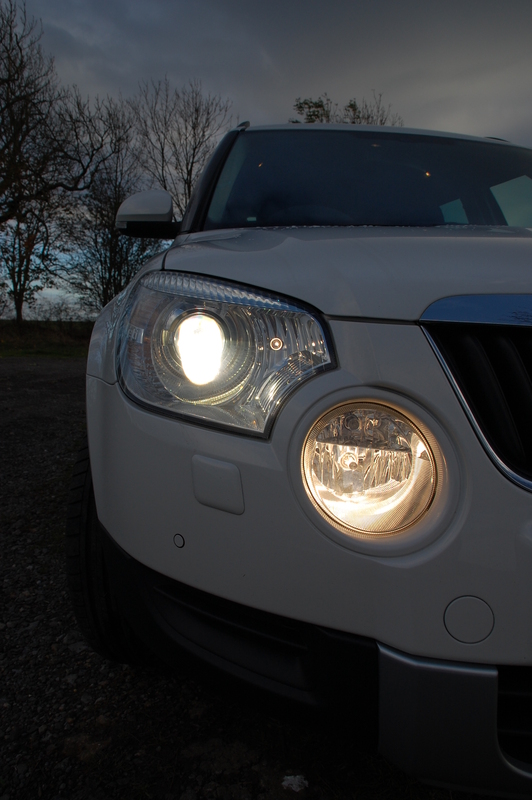 The Yeti possesses a surprising amount of alacrity for a small SUV too. Doubtless, the fact it’s got a healthy stable of 168 horses squeezed under the bonnet helps, but it really goes with a decent amount of pace. Whilst bluff aerodynamics limit the top speed to an acceptable 125mph, the dart to 60mph is an impressive 8.4 seconds. That sort of speed would easily see off many a chavved up special at those wholly unofficial traffic light Grands Prix. 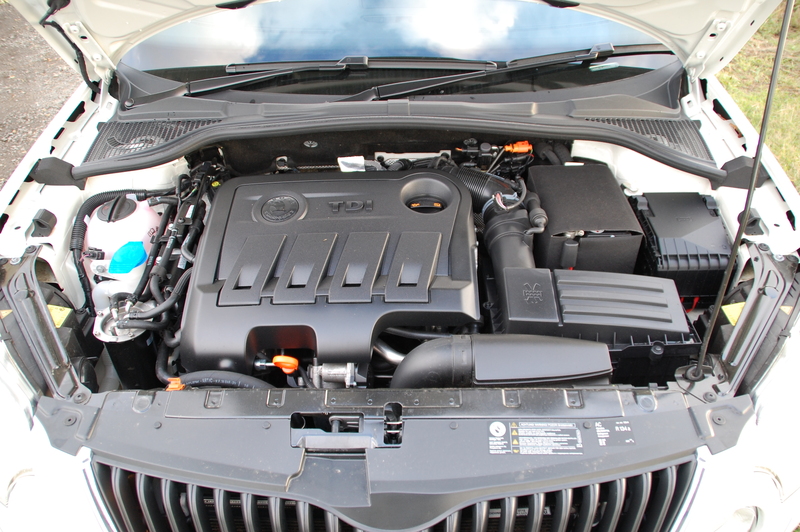 The TDI engine delivers its power in a linear fashion with no discernable lag, permitting smooth progression through the slick six-speed manual gearbox as well as providing relaxed cruising pace to the benefit of a claimed economy average of 47.9mpg. I was regularly seeing low to mid-40s on my drives, which mixed slogs down the A1 with suburban routes. It’s no surprise at all that the Yeti proved to be a great all-rounder, as its reputation over the past couple of years has garnered it numerous awards and plaudits. It really is that good. Škoda buyers will enjoy the fine build, the distinctive looks, sound mechanical package and a brand image that’s both classless and unpretentious. The fact it’s so adaptable and, in four-wheel drive guise especially, able to cover a variety of surfaces with ease, adds to the desirability. 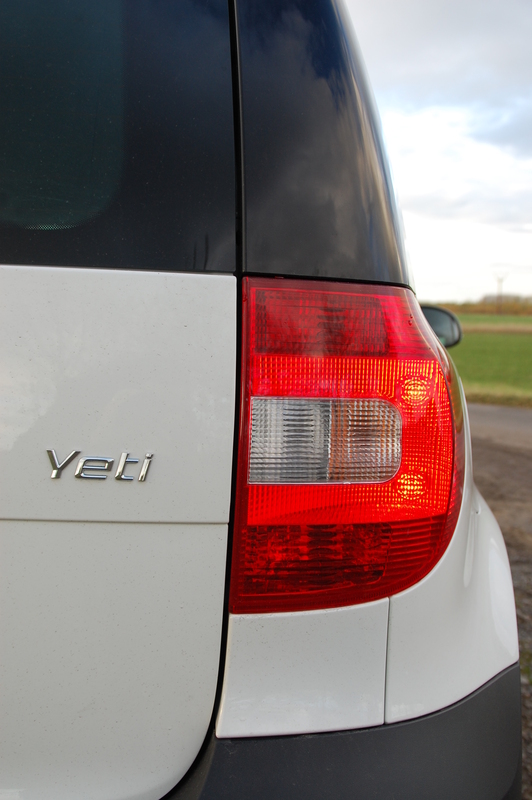 A wide range of engines and trims ensures there’s a Yeti for most pockets too. The Yeti’s a car with a multitude of attractive qualities that would fit into my life with ease. Giving it back after a week was a galling too. So, the burning question – would I buy one? Yes, definitely, although I’d personally sacrifice 30bhp and specify the excellent DSG gearbox instead. But whichever you go for, you’ve made a sound choice. You should take part in a contest for one of the best blogs on the web. I will recommend http://www.keithwrjones.com! I have bought a yeti elegance and I do agree that the car is good but the people associated with it – especially the dealer is good for nothing. I like its elegance..the affordable 4×2 Yeti probably will have tougher competition in the market sales due to its price.